Square Enix has released 6 high quality screenshots from the Final Fantasy XIII demo that was released two weeks ago. [Rumor] Star Ocean: The Last Hope coming to PlayStation 3? 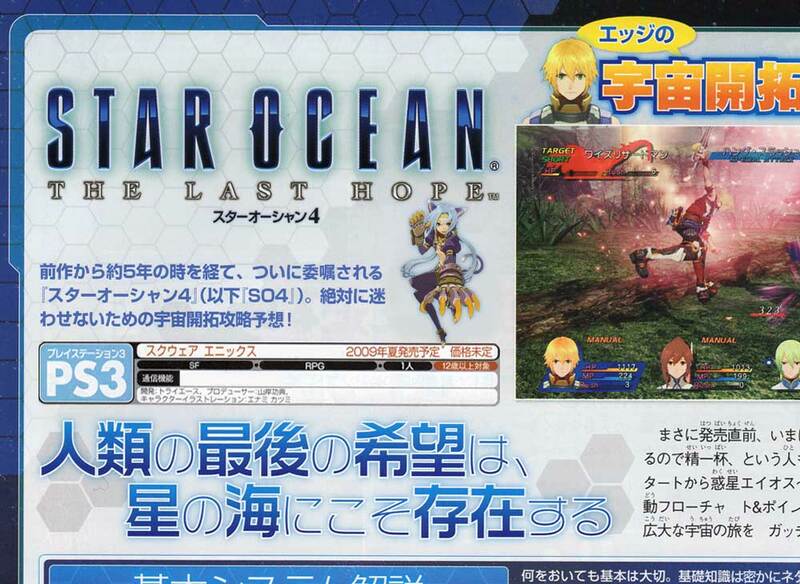 There's a rumor on the internet that Star Ocean: The Last Hope will be released on the PlayStation 3 after a scan from the latest Famitsu magazine has appeared. Let's hope the game will be released on the PlayStation 3 so that more fans (like me) can play it. That's right, Square-Enix has proven that Final Fantasy is recession proof. Opening day sales have ranked up to 100,000 copies worldwide. Of course, this does include all of the imports from people looking to pop the FFXIII demo disc into their PS3. 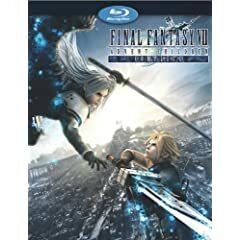 The blu-ray version of Final Fantasy VII Advent Children has sold more than three times any other anime released on blu-ray. The movie itself features both Japanese and English audio tracks. With the Final Fantasy XIII trial having a heavy contribution in these figures, the demo only features a Japanese language and subtitle track. When the blu-ray hits North American shores on June 2nd, it will be interesting to see how sales compare against it's Japanese counterpart that included a trial to the most anticipated RPG of all time. Stay tuned to see where this goes. Final Fantasy XIII coming winter 2009? As the release date of Final Fantasy VII: Advent Children--accompanied by the Final Fantasy XIII trial--is just one day away, some people have been lucky enough to grab hold of their copies. And, of course, the first attraction is the Final Fantasy XIII demo. Whilst playing through the trial, many people have begun trying to take screencaps and videos to post online for those unable to play the trial, there is one particular screenshot provided at the end of the trial. It appears as though Square-Enix plans to capitalize on this holiday season as much as possible. Of course, this release window is strictly for Japan only. The US and EU release dates are expected to be sometime after April 2010. Stay tuned for further updates on the release date of Final Fantasy XIII! The blu-ray version of the hit FINAL FANTASY VII: ADVENT CHILDREN from Square-Enix hits Japanese shelves this coming thursday. Sony Pictures has contracted the North American release to come this summer. North America's blu-ray version ships June 1, 2009. The NA version will not include a Final Fantasy XIII trial, however it is expected to have some Final Fantasy XIII trailers included. While none of these trailers are expected to be exclusive to this release, it will be rendered to show what the game looks like so far on HD playback. Amazon is now accepting pre-orders. So, what are you waiting for? Pre-order your copy today! Yesterday Square Enix has released Final Fantasy VII on PlayStation Network in Japan and the game can be played on PlayStation 3 and PlayStation Portable. It is the international version of the game and it can be bought for 1,500 Yen and is 1715 MB in size. If the game will be released on PSN in the United States and Europe is currently unknown. Dissidia: Final Fantasy US Debut Trailer! A few days ago Square Enix has released the United States Debut trailer of Dissidia: Final Fantasy. This PlayStation Portable game will be released in the United States this Summer. Europe will follow in Autumn. Final Fantasy XIII coming to Wii! Square Enix has announced that next to the PlayStation 3 and Xbox 360 Final Fantasy XIII will be released on the Nintendo Wii. Motomu Toriyama, director of the game: "We at Square Enix has decided to bring our next installment in the Final Fantasy series to the Nintendo Wii, because of the good use of the Wii-mote in the battles." The graphics of the game will be changed to make it compatible with the Nintendo Wii. Also the length of the game will be reduced to fit on one Wii Optical Disc. When the game will be released has not been released. Happy April Fools everybody!